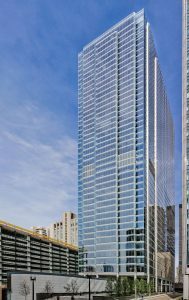 Located in Chicago’s River North area, 353 N. Clark is a newly constructed, 45-story property with a combination of office and retail space. Designed by renowned architect, Dirk Lohan of Lohan Anderson, the building features a curtain wall of articulated glass and steel and nine-foot floor-to-ceiling vision glass allowing for unobstructed views of the city skyline. Reed Construction was selected to complete the 27,500 square foot spec suite build-out on the 19th and 27th floors of the property. The interior construction mirrors the building’s dramatic architecture including curved soffits and angled walls, large break rooms with solid surface tops, and curved and angled glass office fronts. 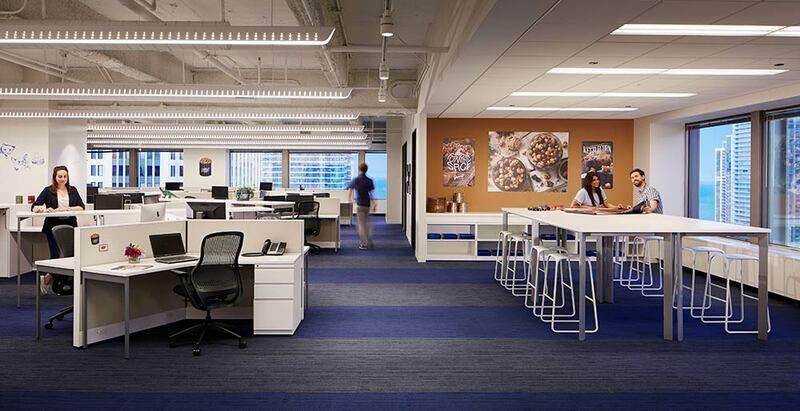 The space also features open ceilings representative of today’s modern office environment. Jack Hennessy led the project management team for Reed Construction. Brendan O’Carroll served as the project engineer and Dave Szytz was the project superintendent. Fitzgerald Earles Architects and Associates provided the architectural services.